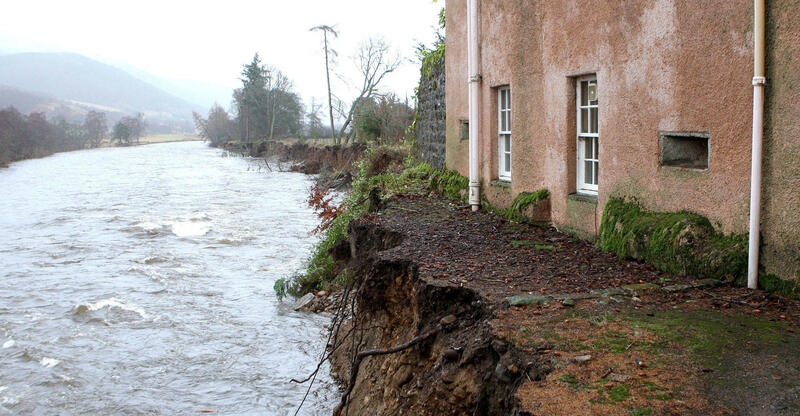 A riverside Scottish castle was left teetering on the precipice of disaster after raging floodwaters eroded the banks of the river near which it sits. Now, the 16th-century Abergeldie Castle is perilously perched mere feet from the River Dee's newly fashioned bank. Built around 1550, the four-story castle is located in Aberdeenshire, Scotland. Noting its remarkably well-preserved architectural and design features, local authorities listed the structure on the local historic building registry in 1972. "This 16th century tower house retains many original features and is particularly distinguished by the early nineteenth century additions of the belfry and Venetian window," explains the structure's official listing with Historic Environment Scotland. According to local legend, the castle's dungeon was once used to house suspected witch Katy Rankin, who ultimately hanged on a hill overlooking the house. Since then, the structure has housed several members of the royal family, including Princesses Louise, Victoria and Maud of Wales, daughters of Edward VII. Now, however, the structure's future is uncertain, as its current residents have evacuated following warnings that more rain could be in the forecast. Storm Frank is the latest and strongest in a series of windstorms to bring heavy rainfall and devastating flooding to parts of the United Kingdom. Throughout the season, the region has reported seven fatalities and damages estimated to cost nearly two billion euros.